The best wilderness survival knife is a delicate topic. If you’d have to pick only one, to be your companion in a hairy situation, you’d find yourself in a bit of a confused. With so many options available, it might made your head spin. There’s a concept called “living off the land” using only a knife as a primary tool. 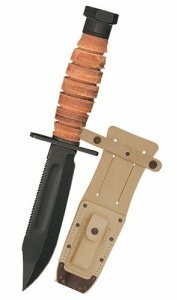 Well, given the circumstances, this must be the best survival knife, because your life may depend on it. What makes the great wilderness survival knife? The best wilderness survival knife must be versatile (you’ll be using it for almost everything: dressing game, digging, batoning, chopping), strong and reliable and choosing the right one might be your last line of defense in life threatening situations. Its main qualities are a full tang build i.e. a fixed blade (the thicker the better), high quality materials and workmanship, an ergonomic/grippy handle, a solid pommel and most importantly: the knife must be fairly easy to sharpen/hone.